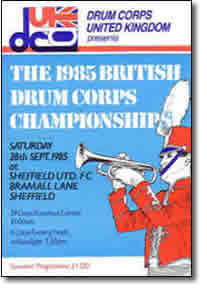 On Saturday, 28th September 1985 over 2000 young people will meet at Sheffield United Football Club, Bramall Lane, Sheffield for the annual British Drum Corps Championships. The climax of this summer's drum corps season will see 25 units from many parts of England and Scotland compete for the British Championship. A large crowd will experience a feast of sound and colour with the big band sound of the brass and percussion being complemented by the flags of the colour guard and complicated marching routines tot give a total audio visual effect. An all day preliminary knockout contest will end with a floodlight evening finals commencing at 7.15pm. The end of a day which presents everything of value in today's yound people.